Boyds, Md. (November 16, 2018) – The Washington Spirit are now accepting deposits for Season Memberships for the 12-game 2019 NWSL season. For the first time ever, season memberships will offer a Flex Account in addition to the traditional Assigned Seating Season Memberships. For 2019, there are two Season Membership offerings. We will still be offering the traditional Assigned Seating Membership with a $50 deposit per seat. New for 2019 is the additional offering of a Flex Account which brings back the popular flex package option. A Flex Account Season Membership brings true flexibility to purchasing Spirit tickets at any section or level for any game. To use a Flex Account, fans can pay to load credit onto their account, which allows them to quickly and easily purchase tickets for any regular season Spirit home game, in addition to any matches played at Audi Field. Flex Accounts are available for both individuals and families with initial balances starting at $250 and $500 respectively. With the Family Flex Account, every member of the household will receive the Season Membership benefits. During the Early Bird period (ends December 21), families interested in enrolling in the Flex Account Membership can do so for as low as $400 with a $100 deposit. Starting now, returning Season Ticket Holders from 2018 looking to renew a Season Membership with the Washington Spirit for the 2019 NWSL Season only need to place a deposit to lock in their membership with “Early Early Bird” pricing by December 3. To guarantee the Early Early Bird pricing, members must pay in full by December 21 at 5 p.m. This is an exclusive offer for returning members of the Spirit Season Membership program and is being extended to any previous Spirit Season Ticket Holders with the Spirit that did not return for 2018. 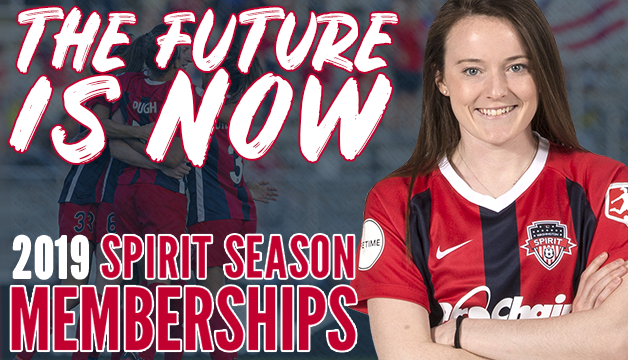 For those who would like to begin a new Season Membership with the Spirit in 2019, deposits will be accepted from now until December 21, with “Early Bird” pricing included for those who place a deposit during that time and pay in full by December 21 at 5 p.m. Season Memberships will go on full sale on December 21 at 5 p.m., until the beginning of the 2019 season. Season Memberships will be full-price when bought during this period, so fans looking to be locked-in for “Early Early Bird” or “Early Bird” pricing should pay in full before then. Complete details, pricing, timelines, and a Frequently Asked Questions section can all be found at www.WashingtonSpirit.com/2019ST.